Preschool assessment is important! When we think "assessment", we typically think of progress reports or report cards for the children where we can take a hard look at the levels of growth and development of each student. However, it is much more than that. We should be assessing not only the children, but our physical classrooms, our program goals and even ourselves! Assessing all of these areas will help you to provide a high quality program. Assessments for your preschoolers have many names: progress reports, report cards, developmental progress forms. You may complete them annually, semi-annually or quarterly depending on your program’s policy and state requirements. You may already have a current assessment tool for this or you may be looking are re-developing what you have or creating one for the first time. Any assessment used to determine "where our kids are at" should be based on sound growth and developmental expectations of each age. There should not be a "one size fits all" for your 3-5 year old students. The first thing to look at are milestones. What can be reasonably expected for each age? Here are a few basic milestone lists for you to begin with. Click here or the picture to the right. Once you are clear on the expectations of each age, put together a list that you can use throughout the year to track each child's progress. These assessments are important for proper planning throughout the year. 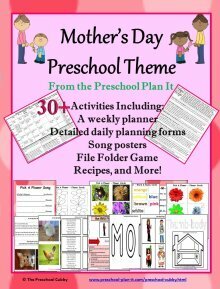 If you are not planning activities based on the developmental abilities and needs of your children (which you will have by knowing the children's abilities individually), then your planning efforts may be causing boredom (for the children who are needing more) or frustration (for the children who have not mastered the skills needed to participate in your activities. Boredom AND/OR Frustration=behavioral issues in the classroom! I've put together some information on how to utilize progress reports for the benefit of the children and your planning as well as samples of progress reports I have used in the past. Click here to read more. Once you have a clear "snapshot" of where each child is, what their strengths are, etc., share it with the parents! How? Through Parent-Teacher Conferences! You should have at least one face-to-face conference with parents each year, especially near the beginning of the year. Click here to read about 10 tips for successful parent-teacher conferences. Assessing your physical classroom environment is important as well. Is your classroom arranged for optimal play, safety and learning or does it leave the children wondering what they should be doing? You'll know the answer to this based on their behavior! If they are always running around from one activity to the next and don't seem to settle at any activity, your classroom may be designed as a runway! Click here to read information on what to consider on how to best set up your physical space. Speaking of a safe classroom, when is the last time we took a good look at all of the items (furniture, manipulatives, etc.) in our classrooms? Take a good look at items and get rid of anything that is chipped, broken, missing pieces, etc. In addition, if you are not already on the Product Recall list, I highly recommend it! 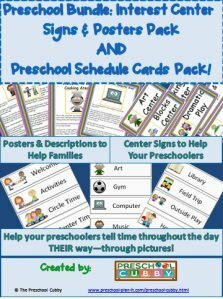 Click here for my article on Preschool Classroom Safety and preschool product recall information. Take time today (or the next time you are in your classroom) to read your program's Mission Statement or Program Policy. What is in your Staff Handbook? What promises have you made to the parents and are you meeting them? A periodic review may help you to refocus on an area that has been neglected! For example, do you promise three or more field trips or in-house field trips per year? Have you done that? If you had a horrible winter, you may not have had that Farm Trip you promised...perhaps you could invite a farmer to visit you! Did you promise parents that there would be weekly science experiments? Are you doing that? 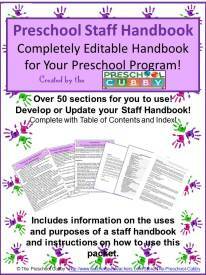 Click here for an article about writing a staff handbook. Check it YOUR parent handbook out and see how you're doing! 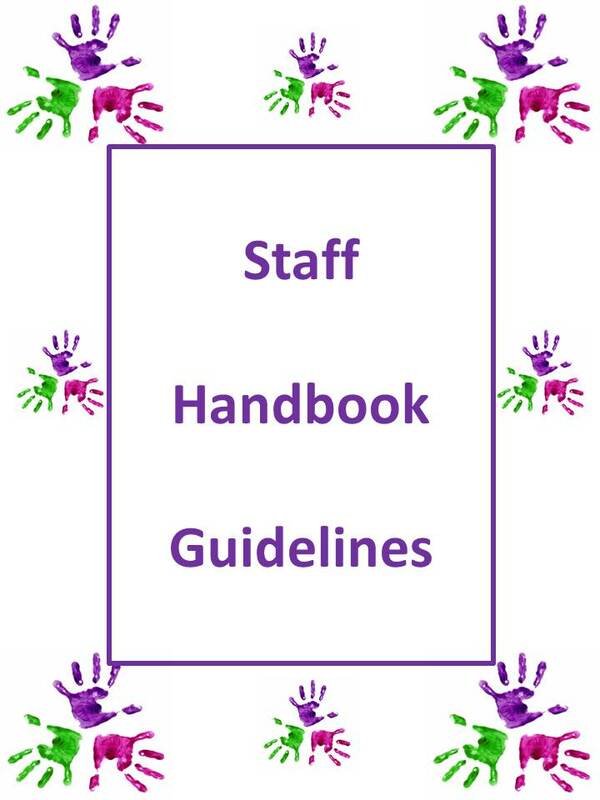 While you are at it, check out YOUR STAFF handbook! 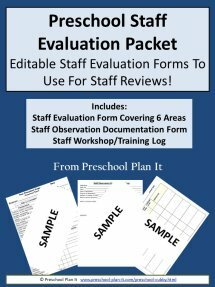 It most likely contains information about the preschool program that will help you assess your classroom. Many of us read it when we are hired and then forget about it. Time to review! 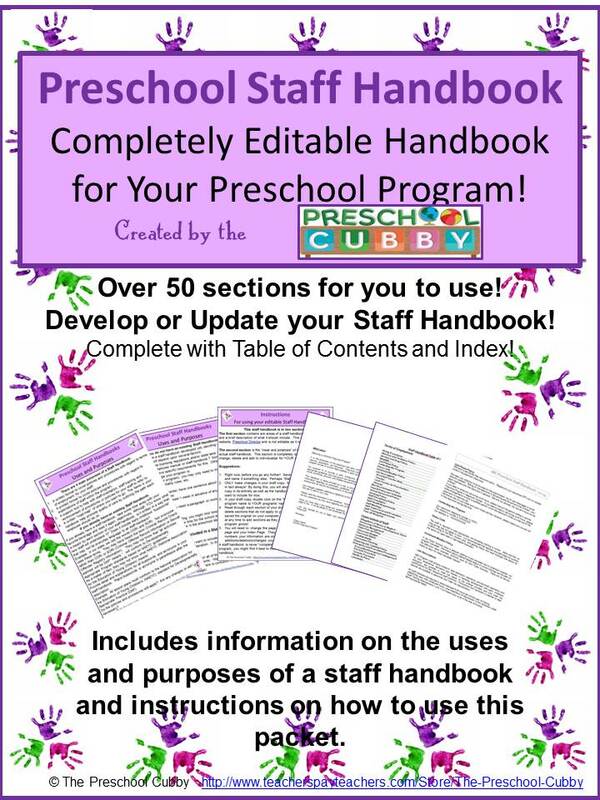 Click here for an editable staff handbook found in my store) which you can individualize! 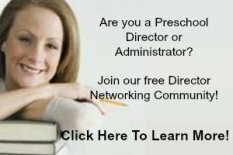 Assessing your overall preschool program consists of periodically reviewing your program's policies, philosphy and mission and determining if you are meeting your own standards. It also consists of you (and your director/administrator) reviewing state or other governmental policies and regulations to be certain that you are meeting those requirements as well. You can not meet state requirements if you do not know what those requirements are. You are the one planning activities and prepping the classroom each day. Be aware of program requirements! Read your state policy book! No, not at one sitting, unless you have a lot of caffeine at your disposal! I recommend reading one section each day. Be aware. When your state licensor visits, he/she will most likely want to question YOU as well with hypothetical questions "What would you do if...". "What is the procedure for a fire drill?". That type of thing. The bottom line is that Preschool Assessment covers more than just children's report cards. 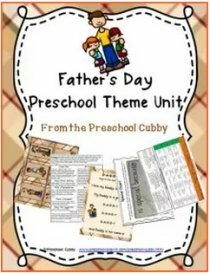 All of the items discussed on this page are what will make and keep your program one of high quality and best for your children to grow and develop in!